This is a great shirt but please be warned that it will majorly shrink. Or at least, mine did. I have never had a Carhartt product shrink this much. Not that it takes away from Carhartts quality, but this may be why it's on clearance? I bought on of these for my wife and I. I bought mine to be embroidered but it now belongs to hear because it's so tight. I bought a Large-Tall and it fits now like a Medium-Regular (if not, Short). It is a great quality and feeling shirt, but I would size up one. This shirt is perfect for almost any kind of weather. 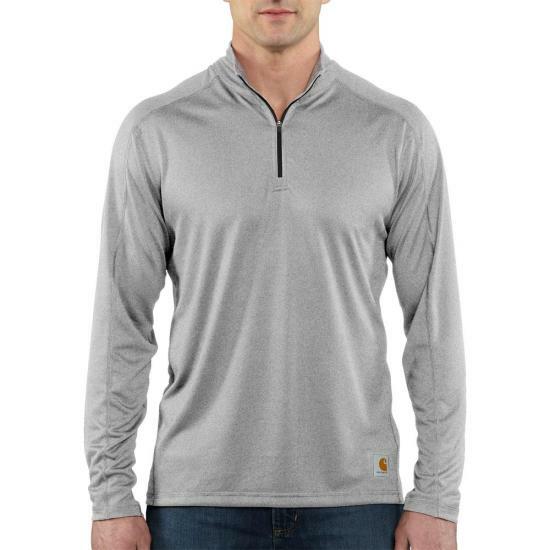 It's great for the cool spring mornings and evenings or can be used as a base layer in colder weather. Highly recommend this product to anyone! Very pleased with this Carhartt product! Very pleased with this Carhartt product! Already looking for more of these. just another great product from Carhartt and Dungarees.net. So glad I can access the whole catalog from you guys for a reasonable cost. The shirt is very well made and can be worn for work or play. Liked them so much bought 2 for me and 2 more for my nephews. Product is everything Carhartt say it is. Comfortable, easy to care for and cool in the summer. These shirts are the best fit in tall man sizes. No other manufacturer can match the quality of the fit on these shirts. I buy everything I wear in the Carhartt brand. Nice Dry-Fit shirt but no pocket. I think a chest pocket would be useful. Medium Weight somewhat sheer.